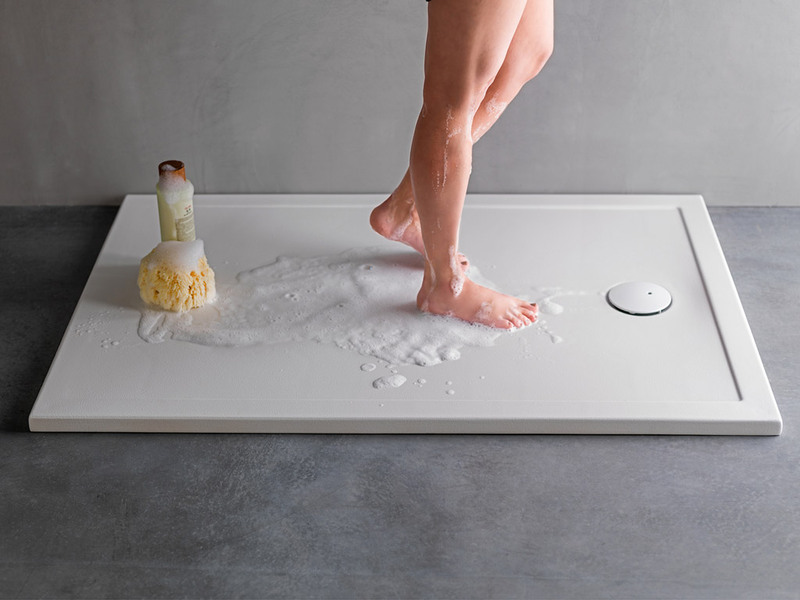 Functionality is installed in the shower with the new Project shower tray series, presented in this edition of the Bologna fair, and designed by Noken, the specialised firm in solutions and bathroom equipment. The shower trays are made with high quality ceramic, namely Noken Ceramic®, top of the range technology that puts together a collection that is not only practical and functional, but also aesthetically versatile. Therefore, the product becomes adaptable again to numerous spaces. Its white finish makes it ideal for small spaces thanks to its visual cleanliness, along with the brightness that it provides, which makes the bathroom space look bigger. In this way, Project also fits in minimalist spaces in which the use is one of the objectives which is mainly sought after, when incorporating details such as an integrated plug which improves the aesthetic and the design, since it creates a surface which is completely uniform. This new collection stands out because of its minimum thickness, which is reduced to the bare minimum. This fact is owed to the compaction at 1250 degrees, which is what the ceramic is subjected to in relation to the elaboration process. Its composition, properties and high-level of resistance to chemicals make its cleaning easier. As well as that, this shower tray model is anti-scratch, antibacterial and antislip, three superior aspects which strengthen its daily use. We highlight the fact that Noken has developed these shower trays in a big variety of sizes. The measurements start from 90x90cm to 140x90cm. Therefore, regardless of the room and the shower space measurements, it is possible to find the perfect Project shower tray model. Discover the new Project collection at the PORCELANOSA Grupo display stand, which can easily be found in Hall 26 B198 – A288 B293.